I sat on pins and needles next to my mom on the 45. I was too nervous of being spotted with the live chicken in our bag. The silver-haired Chinese lady and the unshaven Mission hipster seated across from us clearly didn’t mind but I was too restless. I kept on glancing around to see if anyone had noticed us get on the bus with the bird. Was I crossing a line? Was I breaking a city code by carrying a live chicken in a market bag on a public bus? These would be ludicrous concerns back home where chickens in market bags on public buses are part and parcel of everyday life. But I wasn’t back home. I was in San Francisco where there is, disappointingly, no easy access to live meat birds for slaughtering and cooking at home. Earlier in the spring, a Modesto chicken farmer who had been selling live chickens in the city for two decades was ousted from a farmers’ market after lawsuits were filed against him by animal rights activists. The only other place where live chickens are sold in the city is in a dingy poultry store on the north end of Grant Avenue in Chinatown. “Eight dollars for a hen. Fifteen for a rooster,” the man behind the counter said while he mopped the tiled floors that reeked of chicken manure. The chickens were housed in stacked wooden cages with wire mesh panels crammed inside a tiny room. “I want a hen,” I told him. “Just one?” He seemed surprised that all I wanted was just one hen. He hollered the order at an older man who swiftly pulled a chicken out of one of the cages. “We’re hoping we can choose our own chicken,” I tried to get their attention but it was too late. The transaction happened so quickly and the next thing I knew, he was handing me a confused red hen in a paper bag. I shouldn’t really complain. After the frantic search through internet threads for a live bird in the city, we finally got one. I handed him the cash and we hopped on the next 45. It was almost dinnertime by the time we got home. We decided to slaughter the chicken the following day and make chicken soup for lunch. I assembled a makeshift coop using a large balikbayan box and improvised a roof using Stanford’s dog gate. I laid the hen in her coop and placed a small bowl of fresh water next to her. Up to four chickens are allowed in homes in the city. Up to four small animals like dogs, cats, rabbits, ducks and chickens are permitted in total. That night, we had a red hen and a red corgi in our tiny loft. We didn’t break any city codes. My mom often slaughtered chickens when I was little. On Christmas mornings, she always made arroz caldo with a freshly butchered dumalaga [doo-mah-lah-gah] or young hen, which is prized for its tender meat. Garlic sizzling in a pan of hot oil heralded our breakfast feast of arroz caldo and sweet bibingka. With hens she slaughtered herself, my mom made nilaga — boiled chicken and vegetables and arroz a la Valenciana — rice and chicken cooked in tomato and saffron. Now that she’s seventy-five, butchering a bird is too much work for her so she butchers only on rare occasions like birthdays and holidays. Slaughtering chickens has always fascinated me since I was a kid. I remember standing next to my mom by the kitchen sink and watching her pluck feathers off a hen that had just been doused in hot water. I remember the pile of wet, blood-stained feathers, the severed feet, and the bowl of rice soaked in blood, which she simmered together with the chicken to make tinola — ginger-flavored chicken soup with green papaya and young chili leaves. Witnessing how hens are slaughtered at a very young age taught me invaluable lessons about food. My mom graciously instilled in me and in my sisters a genuine appreciation and respect for the food on our table and the source of that food. And there I was, standing next to my mom by the kitchen sink about to butcher a hen just like we did many years ago. Her instructions were very clear. I held the wings with my left hand and the feet with my right while she grasped the bird firmly by the head. She plucked the soft feathers around the neck and slit the throat swiftly with a knife. I felt the hen twitch as blood streamed out of the soon-to-be-lifeless neck. We collected the blood in a small bowl filled with a quarter cup of rice. 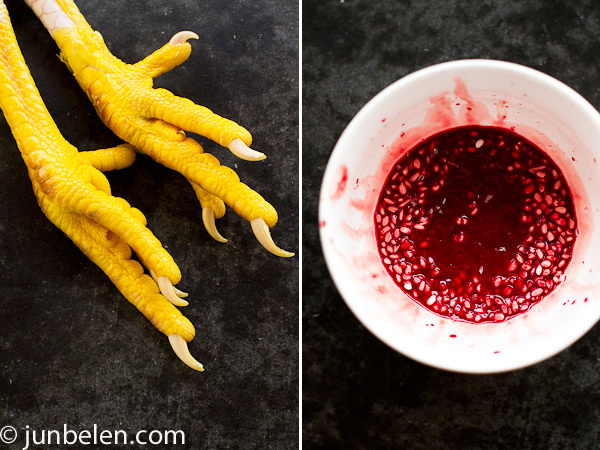 Once the bleeding trickled to a stop, my mom held the chicken by its feet and doused it in a pot of boiling water. We took turns plucking the feathers off the bird and doused it again when it became too difficult to pull out the feathers. She deftly cut an opening under the breast bone and carefully cleaned the inside of the bird. She warned me about the apdo [ap-doh] or gallbladder — the small, almost-black pouch attached to the liver that contained the bitter bile. She told me to be very careful not to puncture the gallbladder when removing the chicken’s innards. She saved the heart, liver, and gizzard and cut the chicken into eight pieces. She simmered everything including the blood-soaked rice in water that she had just used to wash the rice. She simmered it slowly with garlic, onions, ginger, and fish sauce until the meat fell effortlessly off the bone. In place of green papaya, she used chayote that she quartered lengthwise and instead of chili leaves, she used spinach that she added just right before she ladled the soup into bowls. It was the perfect bowl of chicken tinola. It was the perfect way of honoring the life of the slaughtered hen. Nothing could be better. Two hundred posts. Yes, this tribute to slaughtered chickens is my 200th post. Jun-blog has come this far only because of you and for this, I am forever grateful. Sincere thanks to all of you who have welcomed Jun-blog to your home, wherever home may be. I hope you will continue to join me week after week and that you will tell your family and friends about the stories you’ve read here. Sauté garlic, onions, and ginger in oil in a large pot over medium-high heat until fragrant, about five minutes. Add chicken and brown on all sides. Add fish sauce and water enough to cover the chicken. Bring to a boil and simmer over low heat until chicken is cooked through, about thirty minutes. Add salt and pepper to taste. Add papaya or chayote and simmer until tender, about 10 minutes. Add chili leaves and simmer until cooked, about a few minutes. If using spinach, remove the pot from heat and add spinach right before serving. I am this close to becoming a vegetarian … but we must come to accept where our food comes from and how it is prepared so that we can appreciate it more. I just hope you make good use of all the parts of the chicken. Happy 200th post! I only read on Google Reader, but everything you’ve posted reminds me of my mom’s cooking and how much I miss her. I don’t think my mom ever had to kill live animals to cook, but I do remember my dad being part of the lechon preparation party the first time they took me to the Philippines and he had to do all the cleaning, etc. I used to not like the papaya in this, but now I can’t help but munch on it before starting in on the chicken. The broth is super good, too. Thanks for posting this (and everything else). Wow… I could never slaughter anything, much less eat it afterwards. I guess it’s something you become accustomed to. Heck, I couldn’t eat any of the fish I had caught on a past fishing trip either. I love chicken tinola, especially during these cooler months. Congrats on 200 posts! Love your story telling! Freshly slaughtered chicken. I am sure being in the city, you would think this would never happen. You are brave enough to admit it. In the Philippines, even if we got our food fresh from the market, I was not privileged enough to see slaughter (maybe my aversion to fresh blood is the reason for no medical career). But you are right that an appreciation of food, its source and often the use of the whole body of the animal is never discussed often. Looks and smells good from your photo. What a great post, Jun! I was laughing so much at the live chicken story. I shared your angst. As a child, I recall seeing the live chickens being slaughtered in our backyard and back then, I was really mortified! I love Chicken Tinola and was just thinking about it the other day, especially with the colder weather. Thanks for sharing the amazing photos, too! How wonderful that your 200th post shows food, up close and personal. Not always comfortable, but so necessary that we all know where our food comes from. Congratulations on the milestone, Jun! Hi Jun congrats on your 200th post. FYI there was a place off of Irving St. that used to sell live birds but I haven’t been in years. Congratulations on your 200th blog Jun!! Wow!! Such an accomplishment. I am impressed with this post- it’s been one of my goals as a carnivore to slaughter an animal I plan on eating. Thank you for continuing to write about Filipino food in an accessible but intelligent fashion. 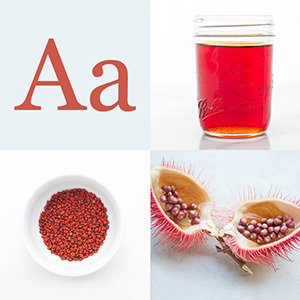 I like to think your blog is a great contribution to the giant subject of Food Anthropology. Cheers! My mom used to slaughter chickens in the Philippines, too. One day I will have to ask her how to cut up a whole chicken — I feel like it’s a skill every home cook should know! And your recipe is the exact same as my mom’s tinola — her secret is to use the rice water, too! Such a perfect cold-weather comfort food. Congrats on the 200th post! Thank you! I didn’t know about the poultry store off Irving Street. I’d have to check it out. I was very close in driving over to Soul Food Farms in Vacaville to get a live meat chicken from Alexis but the timing was just not right. I finally met her at a chicken class in Berkeley (we’re thinking of raising chickens in our backyard in Oakland!) and I think we’ll give it a try again in the near future. Thank you so much for the note and for the shoutout over at Twitter. I’m actually too squeamish with blood just like you. Human blood, to be specific. But, for some reason, I’m okay with chicken’s and pig’s blood. Thank you, once again, for following the blog. Thank you for the note. And, yes! We made good use of all the parts of the chicken — blood, heart, liver, and gizzard — and left nothing to waste. Thank you, Samantha. I wonder if there’s a place in Oakland where we can get live meat birds. I’ll be more than happy to teach you how to butcher chickens. Thank you, Jenni. I’m glad you mentioned the word uncomfortable. I have always felt comfortable about butchering live chickens because I grew up with it but I totally understand how difficult it is for other people. And I’m glad you also used the word necessary to describe how important it is to know and appreciate where our food comes from. Thank you, once again for the wonderful note. Thank you, Jacqui! The secret is, indeed, the water used to wash the rice. The flavor and fragrance are subtle but it definitely makes quite a difference! Thank you for following the blog! I’ve never actually had papaya in a savory dish like this. I’m not even sure if I’ve had chicken tinola before. Will definitely try this. I hope that I could slaughter a chicken. I recently had to break down a live lobster in class (I’m in culinary school) and was doing just fine until I went to skewer the disembodied tail and it flexed and flopped right out of my hands. Baby steps, I guess. Most houses in Singapore are too small to rear chickens, though 20 years ago Chinese women here are known to keep chooks under their kitchen sink. Reading your post made me think about my mother as well, though I’ve never seen her slaughter a chicken herself. She used to eat chicken blood steamed with rice as a kid. Happy 200th post! Yes, I remember that. My mom would so exactly the same and I saw it with as much fascination. But I did have a problem with the smell when you put the chicken with feather in hot water Great write up Jun. congrats on 200th. More to come! Aaah..memories! I grew up in Bicol with our grandparents, and I was my lola’s assistant whenever we have a chicken to slaughter. One question though, why do you put the blood in a bowl with rice? I remember that’s not what we do back then. Beautiful 200th post and congratulations! Thank you for your note and for following the blog. My mom adds the blood-soaked rice in tinola or nilaga and she let’s it cook with the chicken and vegetables to give the stew a richer flavor. Growing up I was not a big fan of the texture of the boiled blood and rice. My mom recalls that my eldest niece, who’s now a mom herself, loved it when she was little. Thank you, Danielle. Now, I look forward to your piece on Hain Ranch Organics. When done properly, slaughtering animals (at least chickens) can be quite fascinating. Dennis is fixated on raising chickens. We’re hoping our landlady agrees to it. We’re trying to make a convincing case. Under the kitchen sink? Interesting. It really is very interesting, too that we have so many things in common including blood-soaked rice. Thank you for the wishes, Chang. GREAT blog post! I really love to open my mind about what I can do in the kitchen and yours in an excellent idea. Thanks! Congratulations on your 200th post, Jun. Many, many more to come. What a lovely post. I remember the time when “fresh chicken” meant a live one. What a beautiful live hen that was but more beautiful still in the tinola. Sorry hen. great blog post! 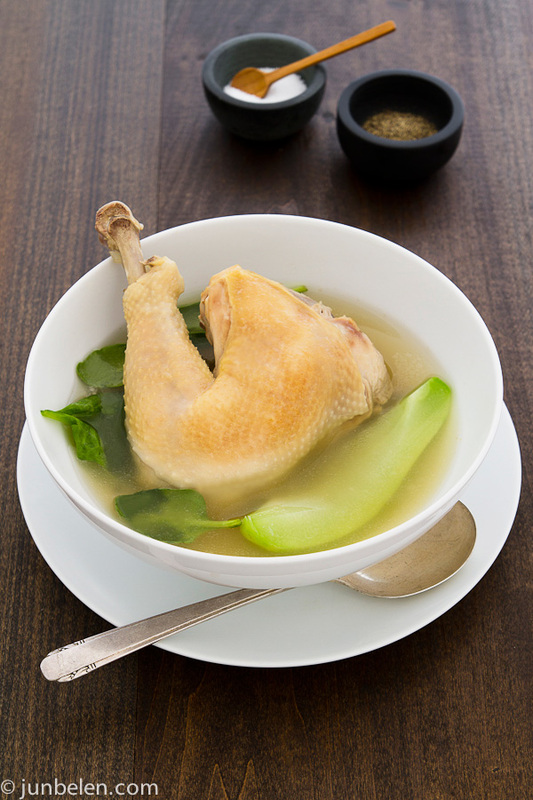 chicken tinola is one of my favorite filipino dishes! never really learned how to cook it though.. but i will definitely try your recipe. thank you so much for sharing! Congratulations on your 200th post! I am so happy to have met you and to be able to learn about your cultures. You have made the butchering of a chicken into a lovely story about love and values of where our food comes from. Gorgeous! Congrats on your 200th post! I cook vicariously through wonderful blogs like your own. Thank you for showcasing, too, one of my favorite cuisines – often the under-dog of Asian food. Hi! Just stumbled on your blog via your paella post (I was making paella last night.) Congrats on your 200th post. I’ve always wanted a chicken coop! Congratulations on your 200th entry! We look forward to more great photos and beautifully written pieces. I love chicken tinola, especially when it’s cooked with lots of ginger. When I was young, I stood witness to the slaughtering of baka, manok at baboy. In this most recent post, I noticed one of the photos (and in your entry) of blood with rice. I vividly remember our cook saving the blood of the chicken, pour it onto a plate and sprinkle it with bigas and sliced ginger, she would leave it to coagulate and then shallow fry. It was very tasty and unusual to see. Very Pinoy indeed, nothing goes to waste! If I didn’t have a husband who would faint at the thought of me slaughtering the chicken at home on the kitchen sink, I would drive all over LA to look for a hen as well! Thank you for your very kind note. I have never witnessed the slaughtering of pigs and cattle and I would absolutely love to. My mom has always boiled the blood-soaked rice together with chicken and vegetables when she makes chicken soup. I am curious to try your version of frying it with ginger. It sounds intriguingly delicious. Thank you once again for following the blog. I am truly grateful. I am so honored that you are learning a lot about your food and culture through my blog. I hope you keep on coming back. Thank you, once again. Best of luck in culinary school, Francisco. I am so glad to finally read your post, Jun. I still remember our conversations during your search for live chickens on twitter. I, too grew up with the sights of chickens being slaughtered and have always considered it normal. I applaud you Jun for writing this, Bravo! Pwede rin malunggay instead of sili leaves. At para sa mejo sweet na sabaw, ok din na may corn. =) Ang sarap nito. One of the best Pinoy comfort food. It looks delicious but…..you slaughter your own chicken!!!!! I am mostly a vegetarian due to factory farming. Your story is such a beautiful example of how we should treat animals, even before they are killed for food. I only wish you did not have to patronize such a sketchy market in order to purchase your hen. Sadly, I doubt your hen was treated well before you took him home. It is ironic that animal rights activists forced a likely well-meaning farmer out of their farmers markets. Thank you, Hillary, for your wonderful note. I understand. I also wished we didn’t have to get the hen from the poultry store in Chinatown but we didn’t have any choice. I was in touch with a sustainable poultry farm just outside the city but the deal to get a live meat bird fell through in the last minute. Again, thank you for leaving a note. I’m so glad you enjoyed the story. My mom also adds corn in her tinola and nilaga. She says it’s like Cebu-style, sweeter because of the sweet corn. Hillary, the “farmer” at United Nations Plaza farmers’ market was simply a middleman for huge Central Valley factory-farms (such as Gemperle Industries) to dispose of “spent” former egg-laying hens. The birds were treated extremely cruel (Animal Care & Control even cited him in 2010 for 795 cruelty violations and had to euthanize a bird), and there were feces (potentially carrying dangerous pathogens) spread throughout the market, on public transit and in restaurants. No Bay Area farmers’ market allows live animal sales any longer, due largely to the public health risks and animal cruelty inherent in having factory-farmed animals in an urban setting. 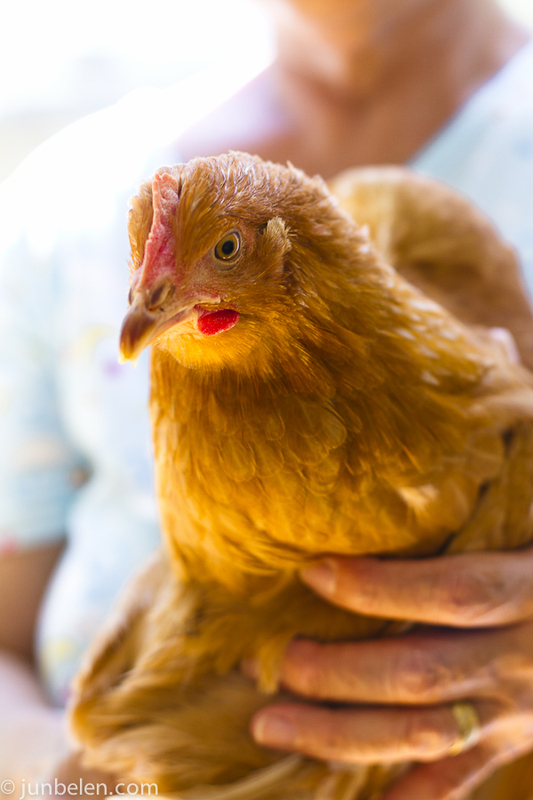 Additionally, a new CA law PC 597.4 bans the sale of poultry in public areas effective 1/1/12. Thank you so much for writing the note. I am a huge supporter of pasture-raised chickens and eggs. I feel sorry that pasture-raised meat chickens are not available for purchase in the Bay Area. Slaughtering meat chickens for food is an important part of my culture and I think meat chickens can be made accessible in the city with proper rules and regulations. Thank you for your response, Jun. Though I now choose to not eat or use any animal-derived products (even though it was my “culture” growing up to eat a lot of meat and dairy, and hunt and fish) because I now know it’s unnecessary, and I feel there is no humane way to raise and kill animals for pleasure and profit – I respect whenever someone makes an effort to source their animal foods from more “humane” sources. As bad as factory farms are (where 98% of our meat, dairy and eggs come from), and even “organic” and “free-range” (which as you probably know, are almost meaningless in terms of animal welfare in practice), I feel there are serious social problems with urban farm animals. We already know from first-hand reports that people sometimes are very cruel to animals during sale, transport and slaughter, or have little regard for their suffering. There is no way to train people or monitor their slaughter methods. It takes more work than many people may expect to keep animals’ areas clean and free from pathogens and vermin. CDC has reported an increase in serious salmonella infections (primarily with small children) at homes of “backyard chickens” (which are often shipped in inhumane conditions from factory-farm breeding operations which also inhumanely destroy all their “useless” male chicks). Neighbors may be traumatized by witnessing or hearing killings. People wind up with unwanted male chicks and “spent” hens, and dump them on already overburdened shelters or animal rescues. I have never used chili leaves. Is there a particular variety of chile that yields the best leaves for cooking with? I guess I will just have to wait for the summer to try different chili leaves. Can’t believe I have missed out on using chili leaves all my life. You have no idea how excited I am to try this. Thanks for the tip. Great post here all together. I am glad that my son witnesses animals being slaughtered at home (just chickens so far). He is on his way to being an experienced gastronaut like you Jun! http://en.wikipedia.org/wiki/Bird's_eye_chili. The leaves add a mildly bitter flavor to soups. You should really try it and let me know how it goes. I’d even add it to stir fries or even deep fry it until it’s crispy. So many options. WOW! firstly,….i can’t wait to try this recipe! And mr. Jun….this is the first of your blog post that i have seen…and TRULY enjoyed it! I will be visiting the Philippines soon…and look forward to trying many of the foods there! I am american..and my lady is filipina and lives in Leyte and the best part of my world! I grew up in the country on a farm..and we always raised our own meats! My dad owned a commercial and custom slaughterhouse…and butchered for 50 years before he retired….so i worked around meat and blood since a small boy! I think its very good and very important for people now days to learn and appreciate our meats and where it comes from….not just some package bought at a grocery store! My wonderful lady is a teacher and in her mid twenties! I have seen many videos of lady’s in the philippines and several asian countries killing chickens and ducks, turkeys..etc….and find that they are very good at it and comfortable! I use to tease my babe about killing fresh ones for us sometimes….she would tease,..sayin’ “thats the old ways babe”….and that many younger ladys there…are now spoiled and a lil’ lazy to kill fresh, ha! But she is awesome and since I do live on a farm today too, says she will be happy to kill and prepare fresh ones on birthdays..and maybe some holidays too! She does know that I value alot of the “old ways”ha….and she does too! She does not kill them inside at the sink though….they do it outdoors…..and lay the critter on the ground and stand on it full weight with one foot on each wing..close to it body…to hold it in place..and quikly cut the throat so it will bleed out! once it is fininshed,..then steps off of it and proceeds just as your story! You know….it seems to me, the birds are usually very relaxed and even quiet during this….even though being underfoot of the lady. they say it gives the critter more of a calming and hiding sensation. maybe their right! anyway…love your article and now lookin’ forward to checkin’ out your recipes! Thanks and take care! Jun, I just stumbled upon your blog courtesy of Pinterest. I’m currently living with my husband and his family in the Visayas. My mother-in-law has taught me how to make tinola with green papaya and mulangay leaves from our yard. I love it! It has a more subtle flavor than when using the chili leaves (which I find still add some spicy-ness). I’m enjoying reading your blog and especially learning more about my husband’s cultural foods! Hopefully I will be as adept at making them as my mother-in-law is. Also, congrats on your 200th post!